Washington, DC – Yesterday, the House of Representatives passed the 2018 Agriculture and Nutrition Act, also known as the “Farm Bill,” to reauthorize farm programs and policy as well as the Supplemental Nutrition Assistance Program (SNAP). “We are extremely disappointed that the Farm Bill passed in its current form. If enacted as is, this version of the bill would cut off basic food assistance for children, adults, and seniors who are struggling to put food on the table. It is disturbing most Members of the House buy in to the notion that some people are more “deserving” of basic food assistance than others. “Approximately 11 million people with disabilities across the United States rely on SNAP to help them eat. Cutting off SNAP – including through new and harsher work and reporting requirements – would only make it harder for people with disabilities and their families to access the food they need to work and to survive. If policymakers are serious about employment, Congress needs to make major new investments in job training and supports and services for jobseekers with disabilities and their families. “The Farm Bill has a long history of bipartisan collaboration and support. The Arc calls on Members of the Senate to work together on a bipartisan approach to Farm Bill reauthorization that protects and preserves SNAP, rejecting the proposed cuts in the House version of the bill,” said Peter Berns, CEO of The Arc. “The Arc is deeply concerned that if enacted, Chairman Conaway’s proposed Farm Bill would cut off basic food assistance for children, adults, and seniors who are struggling to put food on the table. We fundamentally disagree with the notion embedded throughout the proposed bill that some people are more “deserving” of basic food assistance than others. “The Farm Bill has a long history of bipartisan collaboration and support. The Arc calls on Members of Congress to vote against this bill and to instead work together to develop a bipartisan proposal for reauthorizing the Farm Bill that strengthens and protects SNAP and provides supports to workers and job seekers,” said Peter V. Berns, CEO, The Arc of the United States. On net, the Chairman’s draft bill proposes deep cuts to food assistance under SNAP: an estimated 2 million people would lose their SNAP food assistance or see their benefits reduced. The bill would significantly expand SNAP’s existing work requirements, forcing SNAP beneficiaries age 18 to 59 to engage in work or job training activities for at least 20 hours per week. The bill’s exceptions for people raising children under the age of 6 or supporting a family member who is “incapacitated” (as stated in the bill) are likely to prove woefully inadequate and extremely difficult for people with disabilities to navigate. Ultimately, these new requirements would cause many people to lose their food assistance, making it harder for them to work, based on experience with existing work requirements in SNAP and other programs. While the draft bill calls for greater access to job training programs, new federal investments would be funded in large part by cuts to SNAP food benefits, and analysis by the Center on Budget and Policy Priorities indicates that funding levels for job training would be highly insufficient. The draft bill also includes extensive new reporting requirements with harsh consequences if a person misses a deadline. For example, a person who fails to provide a monthly utility bill on time could see their SNAP benefits cut. Obesity is one of the largest problems facing adults living in the United States. Statistics show that one-third of Americans is considered obese. Thirty-six percent of individuals with disabilities are considered obese as compared to 23% of individuals without disabilities. The best way to fight obesity is by eating healthy and staying active. Unfortunately, for individuals with disabilities there can be physical limitations as to what they can do in regards to physical activity. While most activities can be modified to fit the person’s individual fitness needs, this still puts a greater importance on the necessity to eat healthier. Poor nutrition, which can lead to obesity, can also be a catalyst for many other health related issues too like high blood pressure, diabetes, heart disease, and fatigue. There are many reasons as to why individuals with disabilities may not eat as healthy as they should – lack of nutritional awareness, limited income, trouble cooking themselves, difficulty chewing or swallowing specific foods, or sensitivity to certain tastes or foods. If a caregiver cooks meals for them, the individual may have limited input as to what types of foods are prepared. Ensuring that the individual has a say in their meal choices and making a few key changes can help tremendously when it comes to healthy eating. A simple change such as drinking more water instead of sugary beverages throughout the day will help keep you hydrated, feeling fuller with no calories, and generally doesn’t cost a thing. Teaching individuals with disabilities how to save money while at the grocery store will help them pocket some extra cash for other activities or allow them to buy more food. Simple tips such as, using coupons, buying store brand or generic brand versus name brand items, looking for daily specials, and paying attention to expiration dates will help stretch those food dollars. Fresh fruits that are in season usually won’t go bad as quickly and are more cost efficient. Instead of buying yellow bananas that are already ripe (and can go bad quickly) try buying them when they are a little green so that they will last longer. Once bananas ripen, freeze them to make banana bread! Individuals with disabilities who also have mobility issues might have trouble cutting up foods such as, vegetables and fruits. Specially adapted utensils can make this process easier and safer. You can also try purchasing frozen or canned fruits and veggies instead (choose fruit that is canned in 100% fruit juice and vegetables that have “no salt of sodium added” for best options). They will last longer, are already cut up, and are usually a little cheaper. Nutritionists have also shown that there is little difference between the nutrients you receive from fresh and frozen veggies, so go ahead and grab the frozen ones! Large supermarkets and buying in bulk will usually have cheaper prices as opposed to local or specialty shops too. Planning out weekly meals will also help to know what foods to buy in the grocery store to ensure that individuals are eating healthy every day. When working with the individual with a disability to plan out meals for the week make sure to keep it simple. Recipes that are too difficult or take too long to prepare can be discouraging and may make them not enjoy cooking and avoid it. Recipes should have no more than 5 or 6 ingredients. A good rule of thumb when helping individuals make their meal choices is to make sure that 3 of the 5 food groups are present in each plate. This will help to allow for the individual to choose foods they like, but still keep a balanced plate. Making a larger recipe that can be frozen and eaten again later in the week is also a good idea to have for nights when there is little time to cook instead of running out to a fast food restaurant. Cookbooks for individuals with disabilities, like Cooking By Color, help to clearly illustrate what ingredients are needed and how to prepare simple, yet healthy, meals in smaller portions. To learn more about Cooking By Color’s concept and planning for successful eating, check out author Joan Guthrie Medlen’s, HealthMeet webinar. Many resources are out there to help teach the importance of keeping a balanced diet. Choosemyplate.gov and the CDC’s new Healthy Weight Issue Briefs provide information on obesity and maintaining a healthier diet. The Arc’s HealthMeet page contains resources and webinars regarding more healthy eating tips and links for further information. A few years ago, Schenectady County Public Health Services and Schenectady Arc formed a unique partnership to address the high rates of chronic disease and obesity among people with I/DD in Schenectady County through the Strategic Alliance for Health. Schenectady Arc a provider of residential, vocational, clinical, and adult day services in New York State’s Capital Region, recognized that among its 1,480 participants, nearly 10 percent were diagnosed with cardiovascular disease, obesity, or diabetes and wanted to do something to address the needs of those they served. While nationally-based research showed individuals with I/DD were more prone to incidence of chronic disease, Schenectady Arc had confidence that they could help their participants by improving their diet and educating them about healthy eating habits. Further research found that children who participated in a “seed to table” nutrition education program tended to increase their consumption of fruits and vegetables. Through this program, children participated in a variety of regularly scheduled activities such as vegetable taste-testing, hands-on gardening, and recipe preparation. 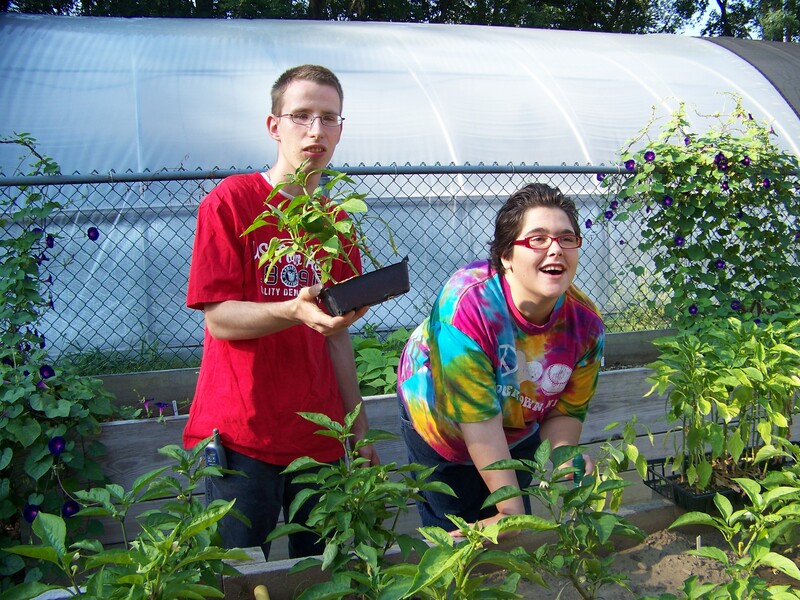 Based on these studies, Schenectady Arc created Know, Grow and Eat Your Vegetables, a garden-based nutrition education program for people with I/DD. The agency’s horticulture coordinator oversaw the new program which was located at Schenectady Arc’s commercial-sized greenhouse in Rotterdam, NY. The coordinator assessed awareness of and preference for 15 vegetable types and, worked alongside 70 participants to plant and cultivate seedlings. 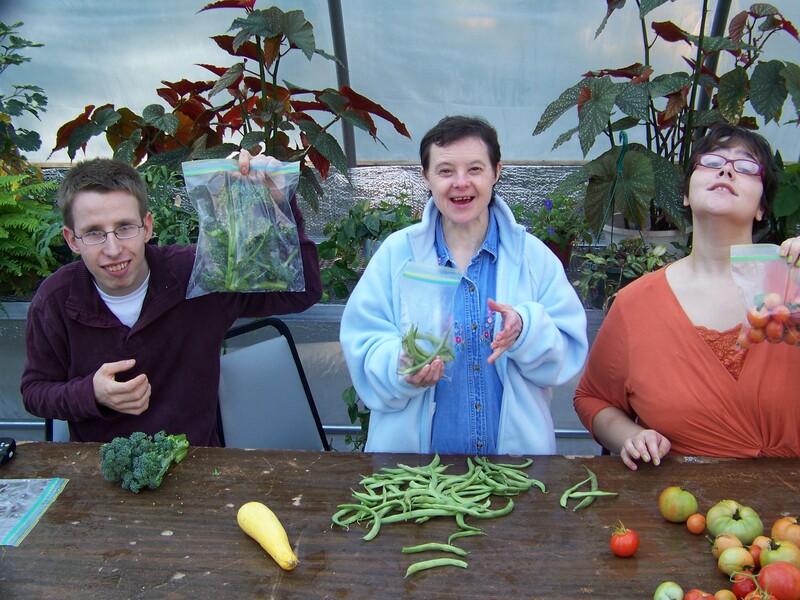 While the vegetables were being grown, nutrition educators from Cornell Cooperative Extension of Schenectady County (CCESC) conducted a six-week program adapted to the specific needs of individuals with I/DD. This training provided participants and staff with strategies regarding healthy meal preparation practices and how to incorporate vegetables into daily meals and snacks. This remarkable program continues to flourish and provide nutrition and education for individuals with I/DD in Schenectady County. Since the program began, participants have harvested approximately 1,000 vegetables. Vegetable packets, along with recipes, were distributed for consumption in group home or family home settings. Last year, this program was named by The National Association of County and City Health Officials (NACCHO) as a model practice and an implementation guide can be found on the U.S. Centers for Disease Control and Prevention website! Also, during The Arc’s national convention, Schenectady Arc and NACCHO presented together, giving chapters of The Arc the opportunity to learn from the success of this program.